In Japan, signers use a Hanko to represent their signature on paper documents. 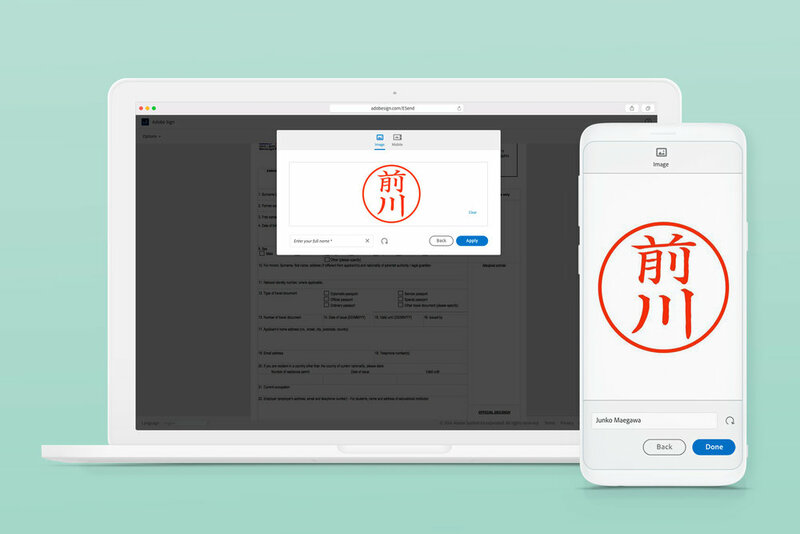 Adobe Sign Stamp functionality, allowing signers to upload and apply their personal Hanko to represent their signature on an agreement. In Japan, a "hanko" personal stamp or seal serves the same role as a signature here. Featuring a person or organization's name, the hanko is used on important documents, bank transactions and major contracts. The goals were to make the experience easy to use but still feel credible and professional. First, I researched and tried to understand what is ‘hanko” and who will be using this. Then drew a very simple workflow and it was pretty similar to taking any pic and then upload to the cloud. There were lots of details and requirements we had to capture for this project, So I worked very closely with the product managers and went through many rounds of design before we came to this point. 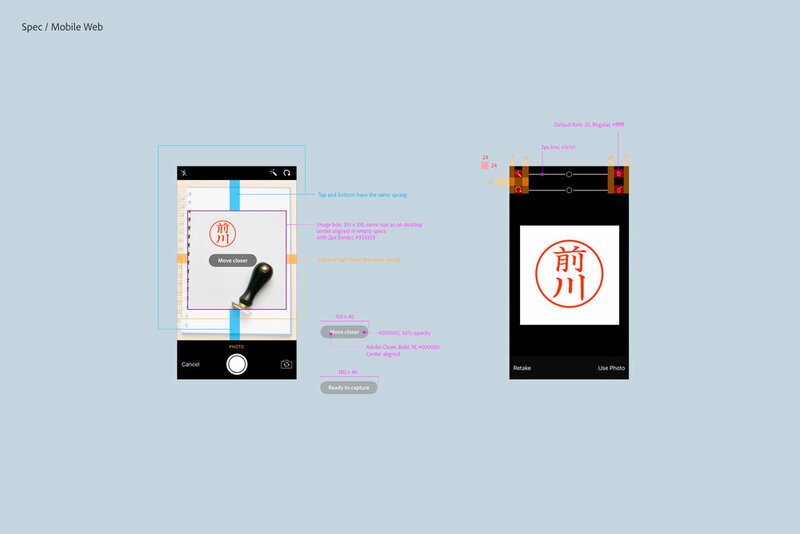 The first part was figured out how to add a stamp from computer, user would drag and drop a picture of stamp on stamp area, adjusting the size, or they can upload a picture of the stamp from their computer as well. It’s pretty similar to how you can upload anything from your local storage to the cloud. You also can send a link from your computer to your phone. So you can snap a picture of stamp from your phone and it will automatically uploads to the cloud and is ready for you when you open the desktop app. 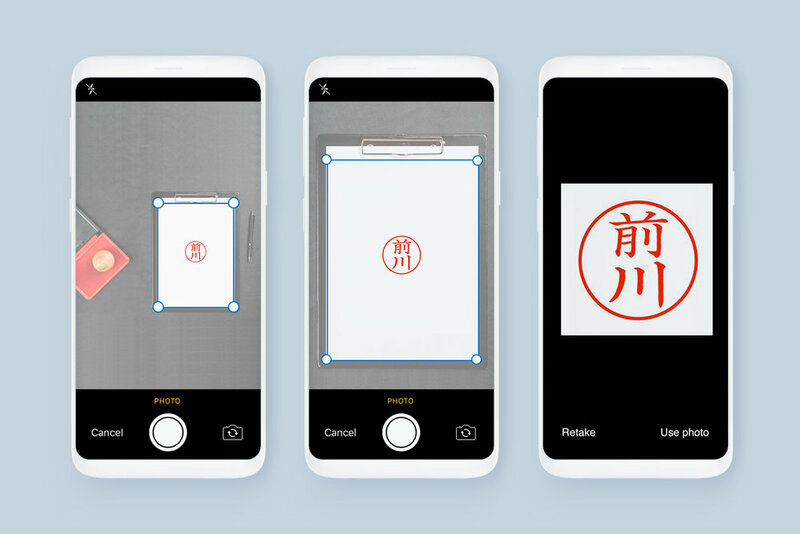 The second part was figuring out the flow of how to take a picture of the stamp and apply it on the document on mobile. I used a native camera component which is better for implementation, especially given the range of users’ devices and screen sizes. After taking a picture of the stamp, the user has two options: retake the picture, or use the one they just took. My priority was keeping the experience to as few steps as possible. When the design was ready, I created specs and worked closely with engineers to implement the finished product.